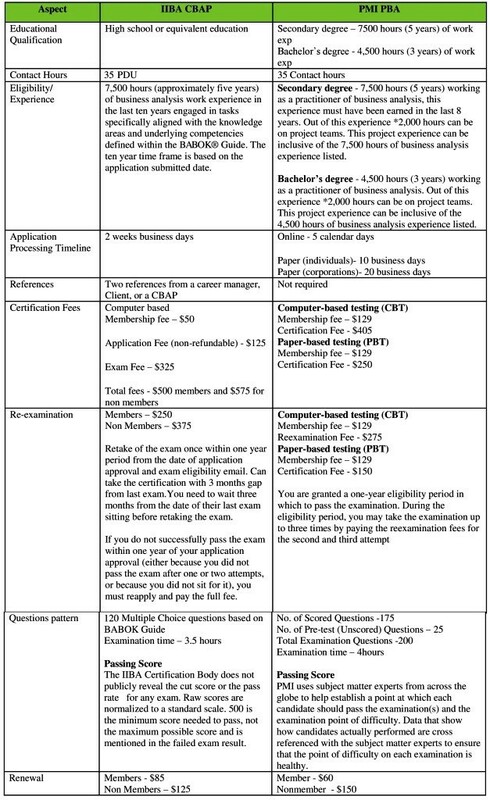 There has been a lot of discussion lately about the impact of the Project Management Institute (PMI)® new Professional in Business Analysis (PMI-PBA)℠ certification on the business analysis profession and what it means to be CBAP and Certification of Competency in Business Analysis™ (CCBA®) offered by the International Institute of Business Analysis™ (IIBA®). First, let’s take a look at what the PMI-PBA is. The PMI-PBA is explicitly for business analysts who work on projects and programs, as well as project and program managers who perform business analysis as part of their role. According to PMI, the certification spotlights your ability to work effectively with stakeholders related to project or business requirements, and ensure projects drive successful business outcomes. 2,000 hours working on project teams within the past eight consecutive years. 35 business analysis education (contact hours). As of this writing (January 2015) the Handbook which will detail the above knowledge areas and tasks has not yet been published. Anyone preparing for the exam must work solely from the Examination Content Outline which explains each of the tasks and provides a healthy list of relevant techniques. One insight to take away is the the PMI-PBA is much smaller than scope than the CBAP® and even the CCBA®. The Examination Content Outline appears to be written around what the business analyst role looks like when the business analyst is working under the wing of a project manager on a discrete project. The IIBA® view of the business analyst role is much larger than this. In contrast, IIBA® does not confine business analysis to projects or programs. In fact, IIBA® explicitly defines a collection of business analysis activities that transcend the project and are applicable to all types of organizational improvement. And, at its best, business analysts should be routinely involved to evaluate opportunities before projects are even approved – or before a project manager has even been assigned. Of course, the PMI view of business analysis is what’s more commonly in place at today’s organizations. However, the IIBA® view gives us something to strive for as we seek out senior BA opportunities and grow our careers generally. The Needs Assessment in the PMI-PBA outline is much more limited in scope than the Enterprise Analysis Knowledge area of A Guide to the Business Analysis Body of Knowledge® (BABOK® Guide), which includes many additional tasks to proactively determine the business needs, current capabilities, and define the business case, rather than to merely review and refine the existing business case or meet with stakeholders to understand their needs. 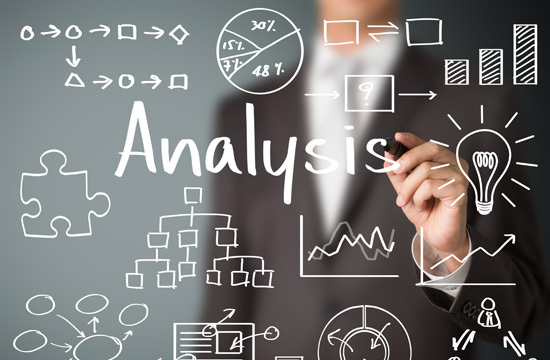 In the PMI-PBA outline, Elicitation is wrapped up inside the Analysis knowledge area, rather than being a discrete Knowledge Area that applies to a wide-variety of different business analysis activities. The Planning task as defined by the PMI-PBA outline is confined to the Requirements Management space, rather than the broader view offered by the BABOK® Guide in the Business Analysis Planning & Monitoring Knowledge area. The IIBA® BABOK® Guide gives business analysts a role in identifying the best possible techniques, activities, and approach to the entire business analysis effort. One area that the PMI definition is broader in scope is that the Evaluation tasks cover some elements of Quality Assurance, whereas the BABOK® Guide specifically limits the business analyst role in this matter. Why two certification options is a good thing for business analysts. Even with a more limited view of the business analyst role, PMI’s decision to enter this space is a sign of many positive things to come for business analysts. With the strength of PMI behind the business analyst role, I think we will see wider adoption of business analysis, as a discrete role from project management, on more and more projects. Through the new practice guide and PMI-PBA certification, PMI will drive an awareness of the role globally that IIBA® has simply not had the resources to do. This is a good thing as it means more jobs, even higher BA salaries and less time spent selling our value. However, it doesn’t seem as if PMI will define and promote the next generation of BAs – the type of opportunities that excite me about being a business analyst and that make it an attractive profession for senior-level professionals looking for leadership opportunities. We need the IIBA® for that. This work is much more challenging and the path to success will necessarily be slower. IIBA® will need our support, strength, and resources to lead the charge on our behalf and keep it going even as the number of PBA credential holders quickly surpasses the number of CBAP® and CCBA® Recipients. Is the PMI-PBA or IIBA® CBAP® or CCBA® right for you? As a professional with limited time and resources, you might be wondering whether you should choose the PMI-PBA instead of the IIBA® CBAP® or CCBA®. While it’s way too early to know for sure how each certification will impact your job prospects and career aspirations, here are some criteria you can use to decide what is in your best interest in the short term. If you are in a project-focused business analyst role right now, and happy to stay there, and your organization is engaged with PMI, the PMI-PBA could be a really good option to gain more internal credibility. If you are in a project-focused business analyst role, but discontent and want a bigger seat at the table (or a seat at all), look to the CBAP®. As a by-product of the certification process, you’ll expand your view of your own capabilities and discover ways to add even more value to your organization. If your organization already supports the CBAP /CCBA route or your certification process is underway, stay the course. You can always pick up the PMI-PBA later should it prove beneficial. If you are targeting project-focused business analyst roles, either the PMI-PBA or IIBA® CBAP® or CCBA® could help set you slightly ahead of the pack when it comes to your business analysis job search It’s too soon to tell if the PMI-PBA is going to significantly outstrip the CBAP® or CCBA® from the perspective of employers hiring business analysts. If you are happy where you are in your career or dislike certifications, then do what you would have done anyway and ignore them all! Of course, many professionals have already chosen both by opting to add the PMI-PBA to their existing CBAP® or CCBA® credential. Since each certification means something different, that is certainly a valid path. Obviously, the PMI entrance into this space signals only more good things to come for business analysts. We’ve reached the point of the professional timeline where we are no longer in the early adopter stage. 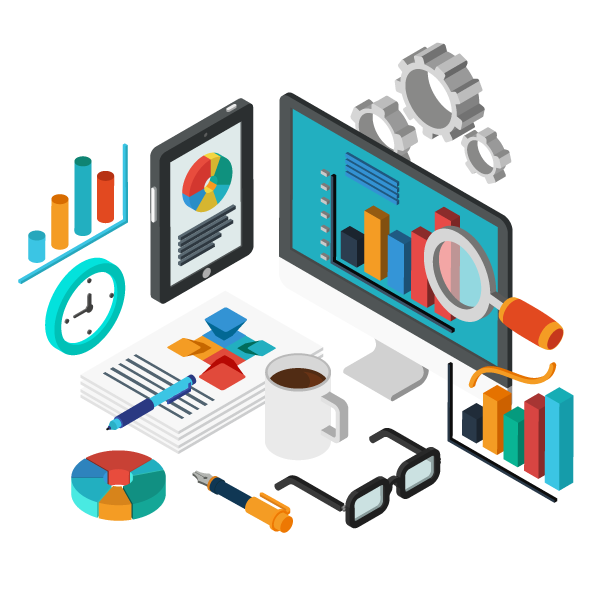 Business analysis is making its way as a proven profession with a wide variety of viable career paths. If you’ve been on the fence for awhile, it’s an excellent time to consider starting your BA career whether that means starting a new business analyst role, shifting your responsibilities, or gaining formal acknowledgment for the business analyst job responsibilities you’ve been doing for awhile. And while the time to get in on the ground floor has passed, it’s still a great time to get in and experience a lot of growth relatively quickly.